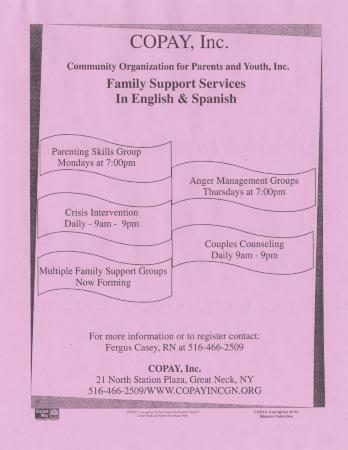 Bilingual flyer from COPAY, Inc. describing family support services available to individuals and families in the community, Suffolk County, N.Y., n.d.;COPAY, Inc., an agency of the Hispanic Federation supported in part by the Great Neck United Community Fund and United Way of Long Island, offers substance abuse treatment and prevention services. Source: Hofstra University. Hispanic/Latino Collection, 1951-2008. Box 1, Folder 36.